Coral Inlay Wedding Band Rings and Bridal Engagement Ring Sets by Native American Artisan Wilbert Muskett Jr. Mr. Muskett offers a traditional styling Wedding Band with raised inlay and each Bridal Engagement Ring is complimented by a round cubic zirconia in a quality prong setting. These beautiful time honored Coral Bridal Engagement Wedding Ring Sets and Bridegroom Inlay Band Rings are wonderful replacement Wedding Band Rings, Anniversary Gifts, Commitment Rings or just signs of affection. 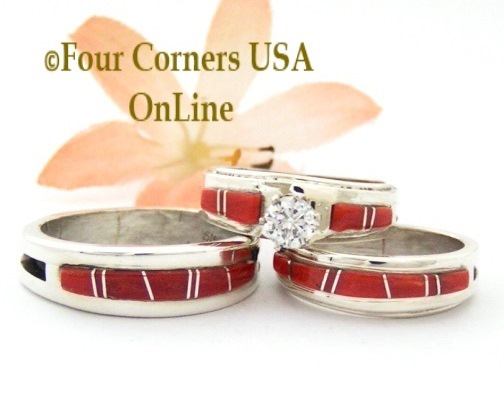 Native American Coral Inlay Wedding Band Rings are a wonderful alternative to traditional or socially expectant Wedding Rings and a true expression of your personal style.